A cat sat atop an electrical pole in for two days in Caldwell, Idaho, enduring wind, rain, snow, and cold before he was finally brought down to safety on Monday. Tiger, safe and sound, is returned to his owner after being stranded atop an electrical pole. And the rescue almost didn’t happen. The cat, named Tiger, climbed to the top of the pole, but couldn’t get down. For more than two days, the feline was perched atop the structure, inches away from deadly transformers that could have electrocuted the animal. The cat’s owner made several calls for help, but to no avail. Finally, a neighbor flagged down an Idaho Power bucket truck that happened to drive by the residence. 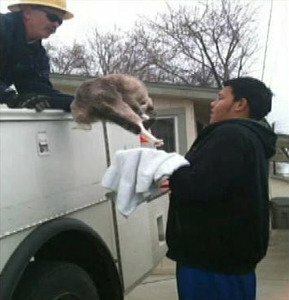 The driver, Jeff Fillmore, had saved several felines from similar situations in the past and agreed to help, despite his company’s policy not to rescue cats. Fillmore placed a cover over the bucket and raised it next to the stranded feline. Tiger jumped onto the mobile platform, was then lowered to safety, and returned to his owners. According Barb Hutchinson, executive director of the Canyon County Animal Shelter, not all cats are rescued from such situations. Tiger is one lucky cat, and CatTime.com salutes Jeff Fillmore for his efforts.